We’d love your help. 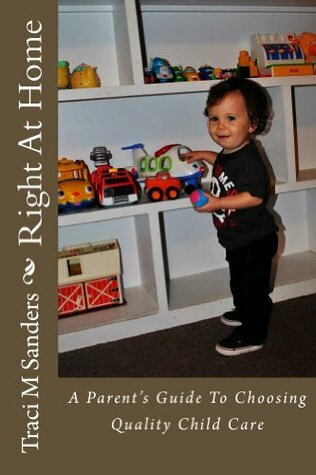 Let us know what’s wrong with this preview of Right At Home by Traci M. Sanders. We apologize in advance for the formatting problems within different versions of this book. The paperback does not have any of these issues of course and it looks really great on the iPad; however, on other digital platforms it is in a bit of disarray. Nevertheless, the information is what you came here for so enjoy! Every parent, at some point, is faced with the need for some type of child care. Whether it's hiring a nanny, leaving your child in the care of a family member or friend, or enrolling them in a child care setting. With more than twenty years of experience in various arenas of child care, Traci Sanders shares her knowledge of the advantages and disadvantages of each type of environment to allow parents to make an informed decision about where to place their child for care. *All the options for child care explaining the benefits and drawbacks of each one. *The three most important S's in choosing a child care setting. *What type of daily schedule a parent should expect their child to have from birth to twelve years and includes suggestions for age-appropriate toys, materials, and activities. *The top twenty questions a parent should ask ANY caregiver when interviewing. *The top twenty things child care providers wish parents knew. *Strategies to make the right decision for the location and price of your child care setting. *Ways to build a relationship with your child care provider to ensure your child's needs are met and your concerns are addressed. *How to ease the transition for you and your child into a new care setting. Making the decision to leave your child in someone else's care is never an easy one but with the strategies and tips found in this book, you can at least make an informed decision. Take back your power as a parent and make the RIGHT choice for your child. To ask other readers questions about Right At Home, please sign up. An avid blogger and supporter of Indie authors, she writes parenting, children's, romance, and nonfiction guides for authors. Her ultimate goal is to provide great stories and quality content for dedicated readers, whether through her own writing or editing works by other aut Traci Sanders is a multi-genre, multi-award-winning author of ten published titles, with contributions to three anthologies. I enjoy connecting with readers and fellow authors.